Welcome to PILATES Hamburg-Nord in Hamburg-Sasel! Stability, mobility and strength are important components of our daily lives. Pilates is a great companion to strengthen our body, mind and spirit and to recharge our energy reserves. 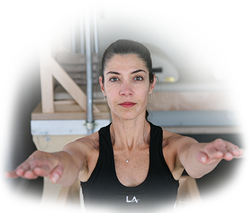 In the relaxed atmosphere of my Pilates studio in the North of Hamburg, you will be personally trained by me, Luciana Pereira da Silva. I’m a certified Romana-Pilates instructor and I offer you a comprehensive exercise programme that is tailored to your specific needs and body type. I teach the authentic, classical method based on the work of Joseph Pilates and Romana Kryzanowska. This method is suitable for all age groups. Beginners as well as advanced Pilates practitioners, women as well as men can participate in a versatile exercise programme. Regardless of whether you are generally interested in Pilates or recovering from an illness or accident; whether you are a sports professional, a senior citizen or a new mother: I will lead you step-by-step through a structured exercise programme during Personal Training or in mat classes in small groups (max. 4 people). For an effective Personal Training, my studio features all important Pilates apparatuses. In alignment with the holistic approach of Joseph Pilates, my Pilates training aims at increasing your body awareness, strengthening your muscles and improving your mobility – independent of your current level of fitness!